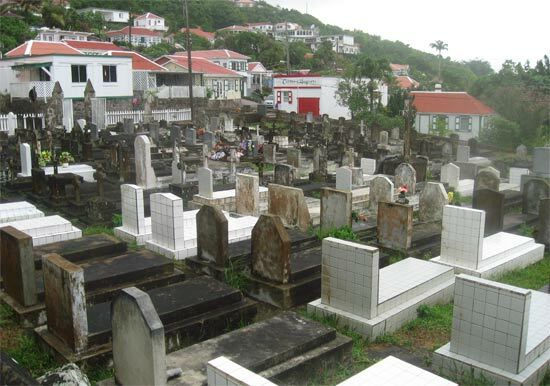 I heard of the mysterious Saba island years and years ago, before our family had discovered Anguilla. Her eyes would light up when she would mention this "vertical rock in the middle of the sea" that has some of the best diving in the world. She told us that Saba is a Dutch island with a very small population. "No beaches, either. It's just a dead volcano that spends most of its time in the clouds!" Saba sounded like an enigmatic spot that I would probably never set foot on. 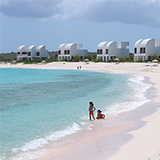 That all changed once my family and I moved to Anguilla in 2008. 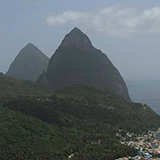 If you live in the Caribbean long enough you are bound to become pretty familiar with many other Caribbean islands, especially the ones nearby. 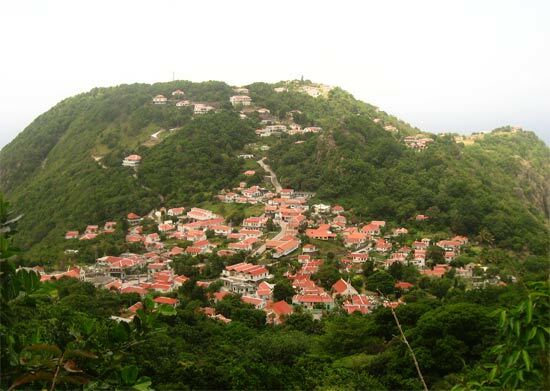 Saba is only 15 miles from St. Maarten, so it was only a matter of time before I, like my hairdresser, developed a strong urge to see this island for myself! My family didn't share my enthusiasm on this one, but a friend of mine, Sam Peabody, was also curious about Saba. The only airline that flies to Saba is the Caribbean airline, WinAir. 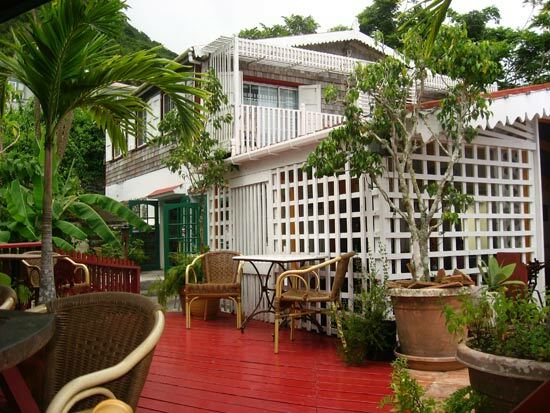 I checked flights to Saba from Anguilla direct. They don't exist. If we flew out of the Anguilla airport, the schedule would be Anguilla-St. Maarten, three hour layover in St. Maarten, St. Maarten-Saba. All for $350 USD. The best way to travel to Saba? 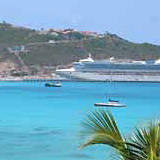 Take the Anguilla ferry to St. Maarten and hop on the plane. This route saves both time and money. The ferry? $50 USD. The flight? $80-160 USD. We took the economical approach! On board the ever efficient Anguilla ferry, Link, I was excited, but my stomach was turning. What was this flight going to be like? 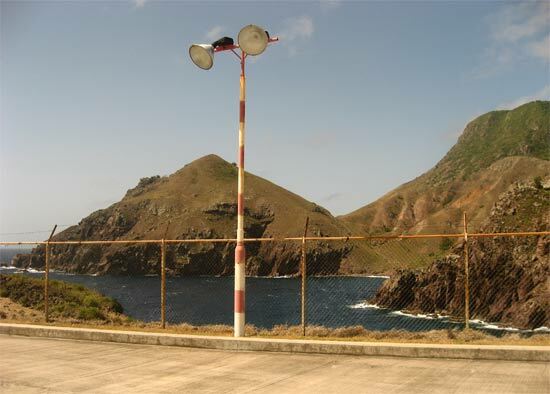 Saba island has an infamous landing. They have the shortest commercial runway in the world, 1300 feet, built on a cliff. 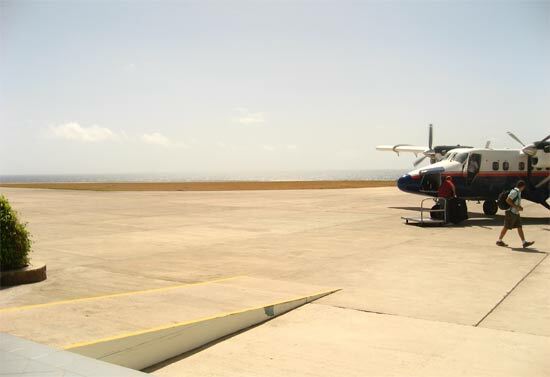 Pilots are specially trained to land in Saba's airport (Juancho E. Yrausquin Airport). 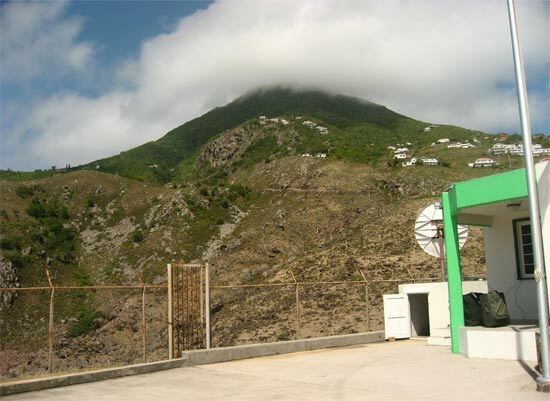 It is difficult to land in Saba, due to the high hills that surround the airport and the cliff at either end of the runway. With this in mind, I held my breath as we boarded the 30-seater WinAir plane. 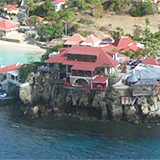 (At least it was bigger than the tiny one we took on our St. Barts vacation!). 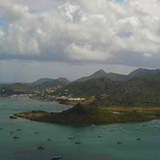 Off we went, soaring above St. Maarten, flying over beaches and resorts until we were left with open sea and sky. For fifteen minutes we cruised along, looking out the window, watching the dark reefs in the turquoise water below. #1) The Tight Approach: The plane approaches Saba on a tighter angle, hugging the hillside. Just when you think you can reach out and touch the goats frollicking in the grass, the plane banks and drops instantly and unexpectedly! #2) The Gradual Approach: The plane does not come in on any tight angles or immediate landings. It slows down in the air, and comes to a full stop. I was hoping for a little excitement, but we got the gradual approach. It was slightly nerve-wracking, just the same. The plane slows down before you touch down. As we came closer to the runway, it felt like we wouldn't make it. Once we were on solid ground, the plane came to an immediate full stop, only using half of the runway. Talk about a dramatic landing! We walked across the tarmac, to the modest yet elegant airport. Not inside yet, we heard a friendly, "excuse me sir". Immigration was calling Sam back. We nearly walked right past the immigration post stationed outside. A quick glance over our passports, and we were out! The taxi driver indicated that it just may be. Outside of the airport there wasn't a hoard of taxi drivers all fighting for attention. There was one taxi van. In no rush, the driver waited until his van was full of various travelers to Saba, and then we were en route to our Saba hotel. Up a winding road we went. Bends, hair-pin turns, hundreds of feet above the airport. I prayed that the breaks wouldn't give out! It sure was a steep ride. The van twisted and turned, up and down, and then finally, climbed one last hill. 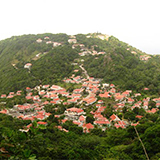 The driver said it would be a two minute walk to our Saba hotel, Ecolodge. We thanked him kindly and hopped out at the top of a grassy hill. The air felt fresh, the grass was green. All was lush. I was very curious to see what Ecolodge would be like in person. Still, how eco-friendly would this place be? Would it be too minimal and feel too much like summer camp? We walked into the reception area (which doubles as their restaurant) and were greeted by a sweet girl from the Netherlands who had just landed in Saba that week. We sat in the cool, wooden house, all lit with natural light (or gas lamps in the evening), and had a drink to pass the time as she checked on our room. With only enough time for a few sips, she returned, and we were off to see our cabin! The Ecolodge is built on a lush hillside that is normally in the clouds. We happened to be there on a particularly clear weekend, which still felt damp, cool and so refreshing. 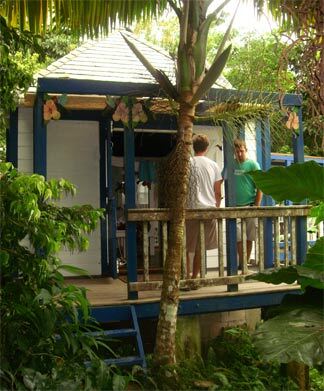 Ecolodge is comprised of several small eco-friendly cabins that are hidden away on the property. Some of them have kitchennettes, some of them come with hot tubs and hammocks. A few have full sized beds, others have one double bed and lofts with twin beds. They were all built with recycled materials and they all use solar energy for light and heat. 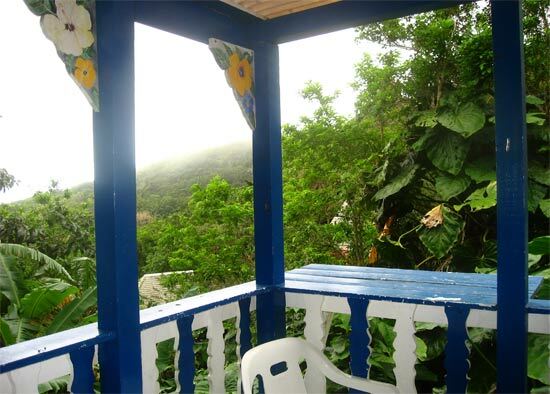 The have composting toilets, and all of the water (not just at Ecolodge, but in Saba on the whole) is rain water. 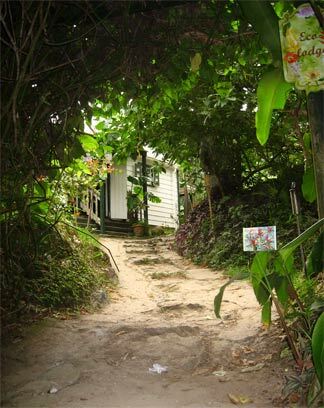 The cottage was rustic and cute, with hummingbirds adorning the fixtures, and rainforest murals. The showers were ice-cold and only lasted three minutes (at the very most! ), but our secluded back porch with a hot tub made it worthwhile! Ecolodge was ideal. The days were peaceful and serene, the nights were cool. The only noises were the sounds of the forest around us. The eco-friendly theme added to the relaxed environment, without blaring music, and endless lights, you felt truly alone. We Don't Have That Far To Go! After we settled in, our stomachs started grumbling. 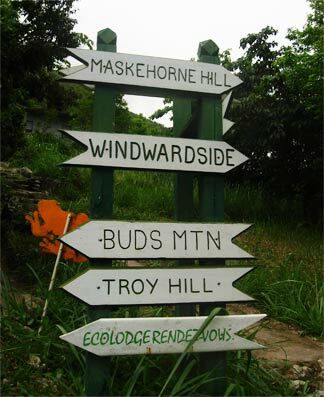 Ecolodge was just "up the hill" from Saba's biggest town, Windwardside. We figured we would take a leisurely walk down the hotel's path to town and get a bite to eat. Well, that hill turned out to be much more than a hill. Sam said it well, "People here must have strong legs!" 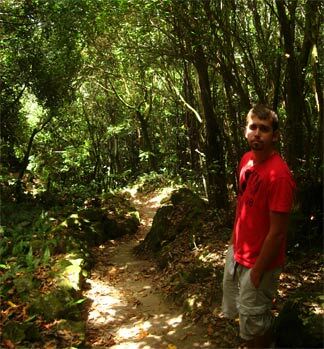 The path was beautifully maintained, rich with tropical plants growing wild. The air felt fresh and clean with an aroma that made me think of one summer as a kid, hiking up mountains in Vermont. Going downhill wasn't so bad, but we knew we would be huffing and puffing heading back up! After twenty minutes of rather careful stepping and working our thighs and calves, we were at the bottom of the towering mountain. Confused, all we saw to our left, right, and straight ahead was a road and overgrown plants. Where was Windwardside? Slightly panicking at the prospect of having to climb up or down more vertical boulders, we took a look ahead. Just cliffs and homes. To the right? All uphill! Boy, did we feel stupid. The whole time the town had been right there. Just a two second jaunt around the bend in the road. Clearly, we were tuckered out, slightly delusional and needed to recharge! We tried the first restaurant we spotted. The atmosphere was calm, quiet and slightly more upscale. The menu was beautiful, featuring many french specialties. Sam and I didn't want anything too complicated, so we decided to split a cheeseburger. 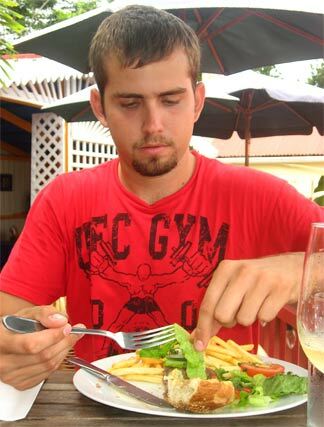 It was one of the tastiest burgers I have had, reminiscent of Didier's... one of my favorite burgers on Anguilla that is now, sadly, long-gone. The burger was stuffed with onions, topped with gourmet cheese, served with a fresh salad in a pesto sauce, and, of course, french fries. That, with a glass of Chardonnay? $30 USD! 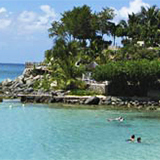 The location was ideal, and the staff was most accommodating and friendly. Sam even hung around after to chat with the chef. A perfect meal! ... And, our energy had been restored. Tummies full, we continued to explore Windwardside. The streets are small, narrow and clean without much traffic, noise or pollution. 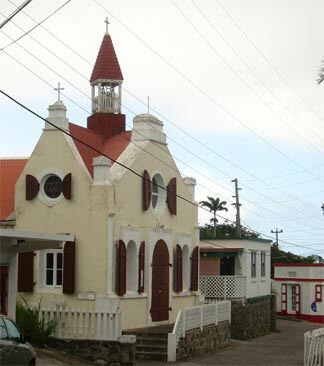 There is one church, a tourist bureau, and a handfull of inns, shops, bars, restaurants and small grocery stores. Most are white with the classic red Saban roofs. We walked through the village on an overcast afternoon, which gave it a small, Northeastern coastal town feel (without the salt breeze). The streets were dotted here and there with locals, tourists, and students from the island's medical school. We explored other parts of the village, away from the center of town and the church, bars and restaurants. Venturing down little "alleys" (cobblestone alleys in the finest state! ), past cute traditional cottages some enclosed by white picket fences, and playgrounds and parks. The first day was coming to a close. Before we got too tired and the sun got too low, we decided to climb back up that cliff. Those stairs back to our Saba hotel were much more menacing going up! With enough time for a shower and a nap, we met friends who were also traveling to Saba from Anguilla for drinks and then dinner at Ecolodge's restaurant, Rainforest Restaurant. This Saba restaurant is one of the best. In the top two! The setting is unique... you dine by gas lamps, completely in touch with nature (baby frogs were hopping along the window panes!). The service was prompt and the food was fresh and full of flavor. Sam had the red coconut shrimp, and I tried the yellowfin tuna in a garlic butter sauce. I've never had yellowfin like that before! And never for that price, either. 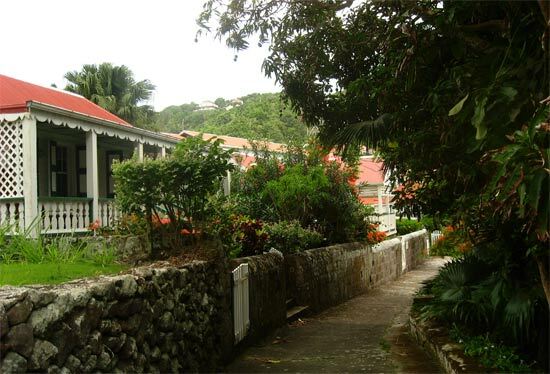 Click here to read about Day 2 of our Saba island vacation.